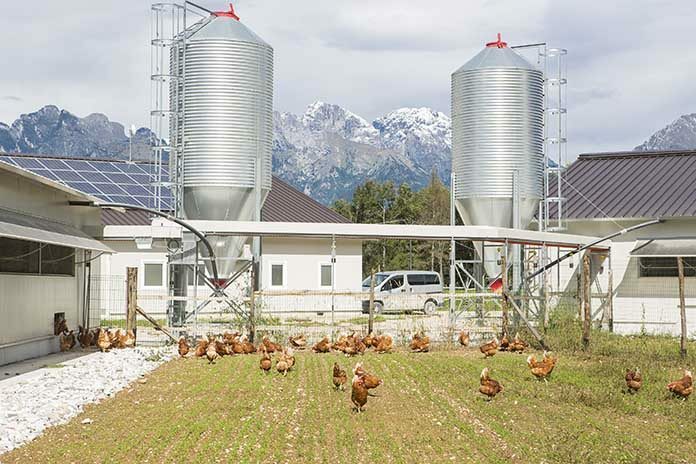 This topic is presented on by John Brunnquell, the founder and current president of Egg Innovations, which is the largest exclusive producer of free range and pasture eggs in the United States. Mr. Brunnquell is also currently a PhD student at the University of Kentucky, studying Avian Ethology and specifically chicken behaviour. His company currently sees over one million birds on range on a daily basis. Range management is still key regarding bird behaviour, no matter the status of the currently contemplated new organic standards. At this point of the presentation, will update the audience as to what the rule is and the requirements that go along with it. The Author will also discuss the timeline and phase in period, as well as items that have been codified. Chickens have five native behaviours: perch, scratch, forage, dust bathe, and socialize. The Author will breakdown each specific behaviour in regards to the ideal situation for a chicken and its importance. Chickens have a desire to roost and jump and perch when given the opportunity. This behaviour can be encouraged by building perches for them, especially ones that that are round and 1-1.25” in diameter. Perch connections should be covered to avoid foot abrasion and be made of material that does not splinter. A major benefit of perching is the general creation of activity. More activity allows more oxygen to flow through the blood, builds stronger legs, and shows less keel bone damage in the bird. This is a similar concept to humans exercising more to promote overall greater health and strength. A secondary benefit of perching is the opportunity for recessive birds to more easily avoid dominant bird aggression in a flock, and provide them with safe spaces to protect themselves. Perching is a habit that can begin being imprinted in pullet barns. Bird behaviour begins developing at four days of age. 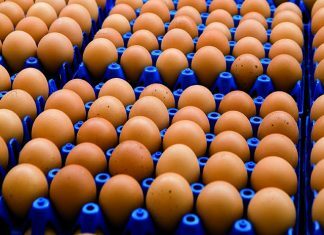 In general, the more similar a pullet facility to a layer facility, the smoother the transition of good behaviours will be within birds. 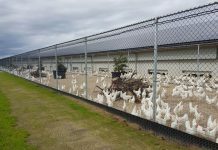 It is recommended that whenever possible, pullet barns include layer barn like features to help the chickens more smoothly adopt upon a transition. The second behaviour native to chickens is scratching. A major benefit of scratching is to encourage claw ware and claw maintenance, like cats using a scratching post or humans trimming their fingernails. Scratching allows chickens claws to stay maintained and not overly long or mangled. Similar to perching, scratching also provides an option of general physical activity for the birds to stimulate health. Proper litter management is an essential piece of the scratching behaviour, that should not go neglected. Litter is used to absorb ammonia and many different substrates are viable, although wood shavings are most ideal. The material should be loose and friable, while always having some visible and fresh (no build-up of manure and feathers) material. It is important to remember that this litter is only to be used as a scratch area and not a nest area, and in Author’s opinion the litter should be 0.5”-2” inches in depth to discourage floor eggs. Foraging involves activities such as ground pecking, scratching and locomotor activities that might result in the acquisition of food or water. It is important to know the difference between foraging and pasturing. 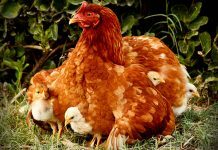 Chickens are not ruminants, and while they will likely ingest some green vegetation, their primary objective is to root around for curious things they can find in the soil, such as insects, etc. It is also important to consider that chickens are aggressive foragers and range management is important from an environmental perspective as well. They have the ability to damage a significant amount of the vegetation, which can cause land erosion. What looks good to a human in a range will look ugly to a chicken. The last thing you want is open hay or grass fields that are routinely mowed to a low level, as you may do in a typical yard or pasture. Instead, chickens prefer tall vegetation and shade, such as trees, shrubs, man-made structures or objects placed in the pasture. Birds are happy to travel far and range up to a quarter mile, so objects of curiosity placed far away from the main housing barn are highly encouraged. You should avoid putting any feed in the pasture however, as this can easily attract predators and wild animals. The main thing to keep in mind when considering range is how to handle a bird’s natural curiosity. A chicken is awake for an average of 16 hours per day and only needs two of those for regular activity such as nesting, eating, etc. They will thrive the highest in an environment that considers the other 14 hours of downtime that need to be filled. This can be done in any multitude of ways and on a commercial scale, suggest filling the range with anything new, different or innovative – such as old farm equipment, downed trees, or other small things to perch on. Dust bathing is an important natural habit of chickens that is lost by not allowing birds outside. The purpose of dust bathing for birds is to both cool the body temperature, as well as to spread oil across the feathers, similar to the concept of preening. As far as the dust bathing area on range, you will want to make sure to have the ideal substrate of either sand or other lighter soils. Well used ranges will typically have very little vegetation near the building, making this the perfect area for this activity. 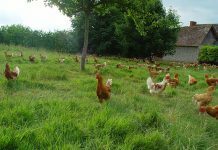 Chickens are very social animals, making socialization the final key behaviour to consider among flock management. As stated before, behaviour imprinting begins at four days old, and the closer the pullet barn environment is to the layer barn, the earlier the birds can adapt healthy behaviours. Pecking orders are often disrupted in larger populations, and there is typically an inverse correlation between the size of the population and the strength of the pecking order. A displaced behaviour that can be mitigated with proper socialization techniques is feather picking. Feather picking is different from feather pecking. Feather pecking is a natural social behaviour of birds, that is light and a form of preening. Feather picking however is an aggressive behaviour where feathers are literally picked out of an affected bird by other birds in the flock. This is displaced behaviour, meaning that some other need of the bird is not being met, such as a nutritional need (methionine deficiency) or management need (crowded environment). In some manner, the aggressive bird is attempting to compensate behaviourally for a different issue. Chickens have emotions. Fear is the most negative emotion a chicken can have, and when it is in the fear stage it will stop everything. This includes eating, growing, exercise, and all other natural activities. One of the best things a manager can do to keep a chicken acclimated to an ever environment is to purposefully change their routine and environment daily, and continue to do new things that do not create fear. This can be as simple as wearing a different colored shirt every day they are in the barns, knocking on the door before entering and creating other noise while doing chores, or approaching them from different directions each day. There are many benefits to managers embracing the science of ethology and the results that come along with it. The concept of allostasis is one that is often lost, but just as important as good management, nutrition, or genetics. Allostasis says that a low level of stress on a chicken is a good and important thing to strive for, similar to humans going to a gym or having other habits they use to destress. We now know that chickens have emotions such as fear, and ethology is very much a science. To have optimal performance we need to incorporate this field of science into overall flock management just as often as the others. As with humans, when we keep all our health systems in check, such as our circulatory system, respiratory system, etc. we are more likely to have lower sickness and death rates. This is also true of animals and why it’s important to consider all their systems, including behaviour. Monitoring all areas will also see increased productivity and generally avoid displaced behaviours, leading to happy birds and a happy manager.